Description - Mohawk's Revelance vinyl planks are guaranteed 100% waterproof and petproof, making this engineered vinyl perfect for anywhere in the home. These realistic looking wood vinyl planks are sure to look great for years to come. Material – Revelance planks are from the SolidTech hard surface flooring collection. 100% waterproof vinyl plank flooring is constructed with 100% virgin vinyl, containing no recycled content, has a high density core and Uniclic Multifit system for faster installation. Revelance features attached underlayment. Size – Grandwood Vinyl Planks are 7" x 49". 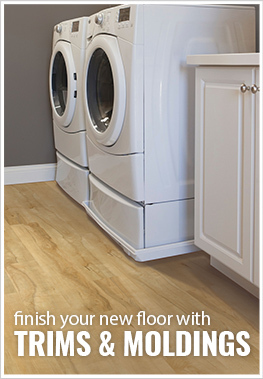 Recommended Uses – Revelance vinyl planks have been successfully installed in kitchens, basements, bedrooms, hallways, foyers, entryways, laundry rooms, and more. For more detailed maintenance instructions, please Click Here. Fewer plank pattern repeats compared to other brands. Up to 30% faster installation time with Uniclic Multifit construction. Mohawk’s Revelance waterproof vinyl planks are beautiful and give a look you are sure to love. At 7” wide and 49” long, these large format wood look vinyl planks and comparable to the real deal hardwood flooring as far as looks, but are more durable. Mohawk’s Solidtech collection features a durable wear layer to stand up to the hard stuff in life and a high quality printed vinyl later to closely resemble real wood. The core is 100% waterproof, making it suitable to be installed anywhere in the home, and truly versatile. 100% waterproof, and built to repel stains and liquids, you can remain at ease if anything gets on your floor. Even pet friendly, Mohawk lets you spend more time enjoying your floors than worrying about them. These planks are super easy to clean and maintain, ensuring you don’t spend all your time scrubbing and getting soapy. Mohawk flooring is safe and kid friendly, so you don’t need to worry about anything scary with your little ones. Life happens, but Solidtech products are resistant to dents and scratches so you have less to stress on. These waterproof planks are approved for installation on any level of the home, including basements! This wood look vinyl can go where traditional hardwoods can’t, making them more versatile than the original stuff. Dimensionally stable, you don’t have to be worried about expansion or contraction like other floors have issues with. Floorscore certified for indoor air quality. Can I put this in my basement home office? Revelance is waterproof and can definitely be installed in a basement home office. If you are using a roller chair, be sure to use a mat protector for the floor where the chair will roll. I went with the cool concrete color for our sunroom flooring and I love it. It's a nice neutral color so I could use colorful decor. The floor looks great! I went with the Burnt Embers color and love the look in my living room. It goes nicely with our fireplace and makes the whole place look cozy and warm. Installation was fairly easy too. A little pricey at first, but after being installed for months and still looking brand new, I am totally sold. Ordered the flooring after getting some samples to decide on the color. Quality is great and instalation was flawless. I would use this brand and product again. The puppies love running on it and cleaning up after them is a breeze.